Close your eyes. Think of a Caribbean family vacation. I’m guessing you envisioned yourself on a lounge chair, cool drink in hand, with your children splashing in the turquoise ocean waters nearby. Let me tell you that a Jamaica vacation is all that you envisioned — and so much more. 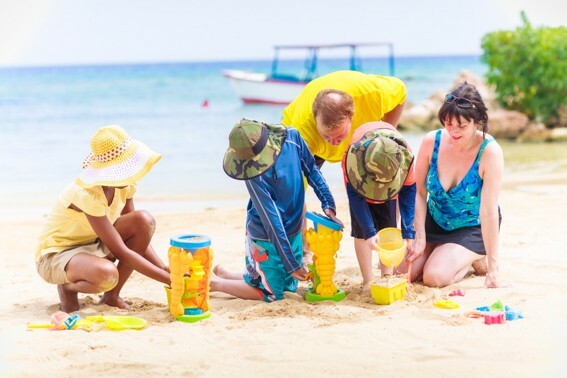 Trekaroo has recommendations for Jamaica vacation spots from all-inclusive resorts in Jamaica for families, like Moon Palace Jamaica, to outdoor adventures that your kids are sure to love. 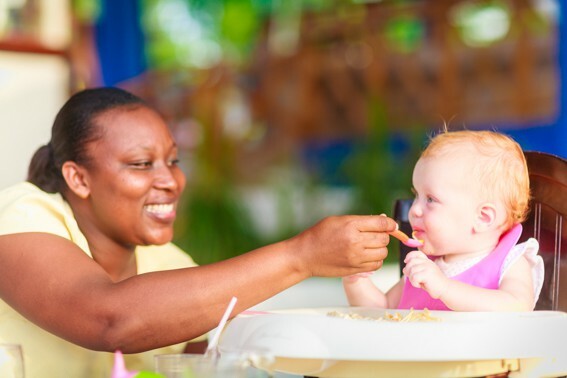 For moms of tots in desperate need of a real vacation, Jamaica’s Franklyn D Resort offers vacation nannies as part of the all inclusive package. So go ahead, close your eyes for a moment, and take that much needed nap ocean side without worrying about the baby. For the more adventurous and energetic, there are plenty of Jamaica vacation spots for the active family. There are waterfalls to climb, zip lines to provide thrills, and even a Jamaican bobsled run to zoom down at high speeds. Finally, don’t forget to take time to meet Jamaica’s friendly people. Enjoy a cooking class and learn to make festival (a Jamaican dumpling), let your tour guide and driver introduce you to the island’s best jerk chicken, and appreciate the laid-back vibe of this island nation until your airplane leaves to take you back home. If you’re a mom of a toddler or two, listen up! I’ve been there — lots of moms have been there. You so desperately want to travel and enjoy a real vacation. 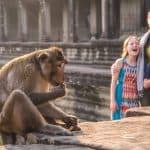 However, there’s no one willing or able to care for your children so the kids simply must go wherever you do — literally. 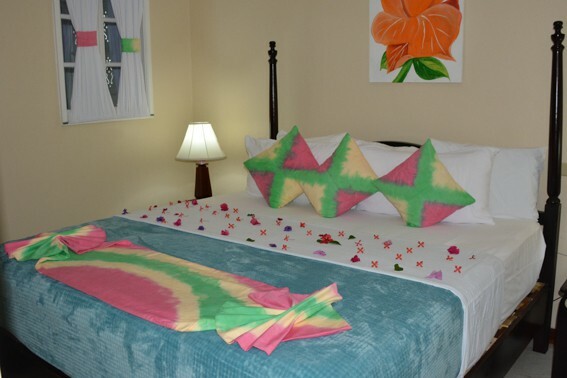 Franklyn D. Resort offers an all-inclusive Jamaica vacation spot for families with children that includes a local nanny. It’s your dream vacation; there’s someone to play with and care for your child while you recharge and enjoy a real vacation. 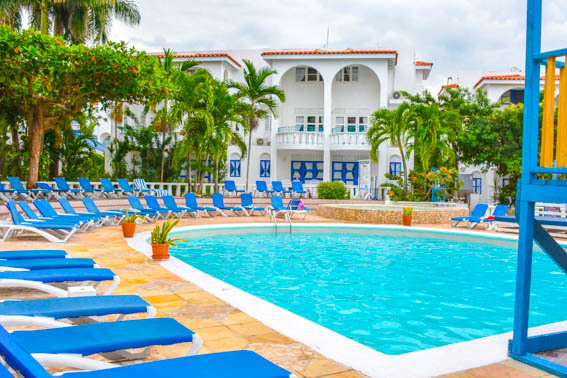 When you’re ready, there are a seemingly endless list of things for the whole family to enjoy together at Franklyn D. Resort from a tot-friendly pool to playgrounds to fishing excursions to craft activities. Or, if you are past that stage in parenthood where you literally can’t get a break, consider the Moon Palace Jamaica Grande. At the Moon Palace Jamaica, you can drop the kids off at a kid’s club for a few hours so that you can enjoy an adventurous afternoon in the rainforest on an ATV or a leisurely romantic dinner. The Moon Palace Jamaica, a high quality all-inclusive resort with one of the Caribbean’s largest spas, boasts a prime location in Ocho Rios. 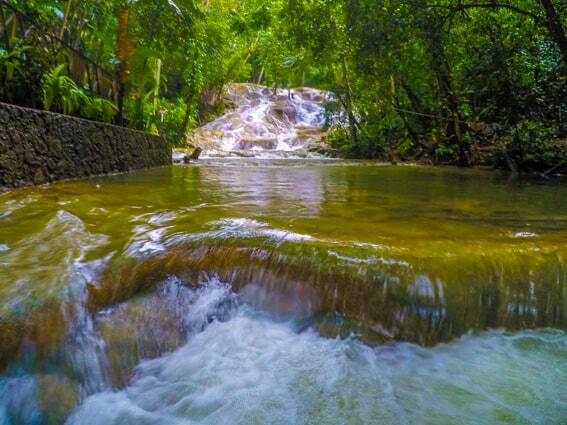 It’s close to many of the best Jamaica vacation spots like Dunn’s River Falls. For a full review of Moon Palace Jamaica and Franklyn D. Resort please read to the end of this article. If you think that Jamaica is all about the beach and the ocean, think again. The rainforest beckons. We focused our adventures on the area between Montego Bay and Ocho Rios. 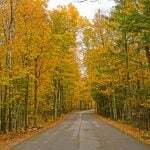 There is easily enough in that 100km stretch to fill a full week of adventure. At Mystic Mountain we took a chairlift to an amazing viewpoint overlooking the city of Ocho Rios. Once there, we experienced a thrilling Jamaican bobsled ride. Not far away, we hiked up Dunn’s River Falls. While crowded, it is one of those uniquely Jamaican experiences. Finally, we spent a full day zip lining, swimming, and floating downriver at Chukka Adventure’s Good Hope just outside of Montego Bay. Be sure to plan your visit to Mystic Mountain Jamaica on a clear day. The views from the top of are spectacular! All visitors begin their visit at the bottom of the mountain and take a 1km ride on the Sky Explorer chairlift 700 feet up to the top of the mountain. 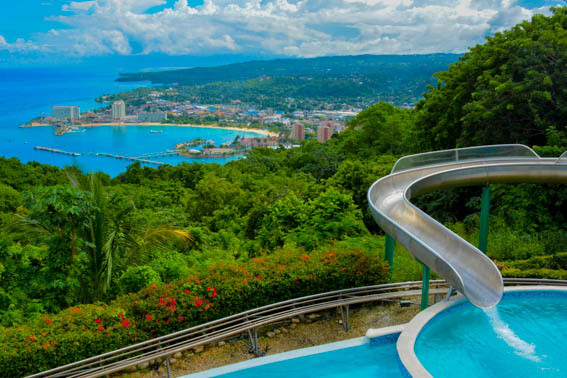 From the top there are 360 degree views of the rainforest, Ocho Rios, and the sea. It’s hard to believe that this was the site of a dump only a short time ago. It’s important to note that attractions at Mystic Mountain, including the innovative “F” shaped chairlift design, were carefully designed to have a minimal impact on its lush rainforest environment. Of all the Jamaica vacation spots that we visited, Mystic Mountain felt most like a true, natural rainforest, and we saw more birds and butterflies there than anywhere else. Mystic Mountain makes a special effort to educate its visitors both about the rainforest and the people of Jamaica. There is a small open-air history museum at the top of the mountain as well as a hummingbird garden and a nature trail. The Mystic Pavilion features sports memorabilia from the nation of Jamaica including a uniform from Jamaica’s infamous bobsled team at the Calgary Olympics. Be sure to show your kids the inspirational Disney movie “Cool Runnings” before your trip. Then everyone will be so excited to speed through the forest on Mystic Mountain’s mountain coaster with bobsleds painted just like the ones in the movie. 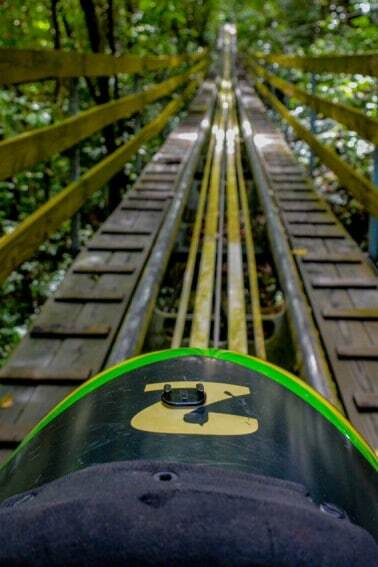 I’ve experienced mountain coasters with my children in the Alps, but the tropical experience at this Jamaica vacation spot is truly unique. 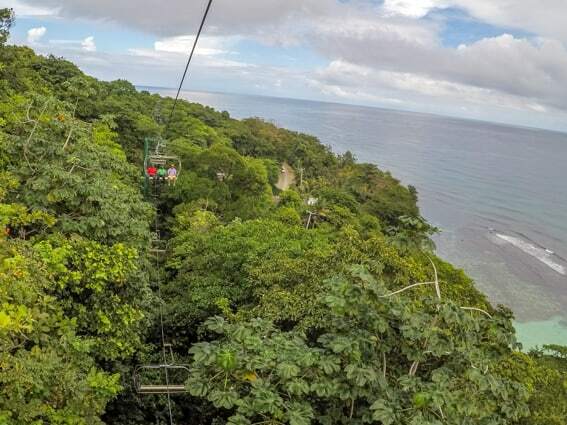 In addition to the the Rainforest Bobsled, Mystic Mountain also has two zip line tours: a canopy tour with five lines and a river zip line that can be added onto the canopy tour offering an additional eight lines. Both are available for children ages 6 and up. 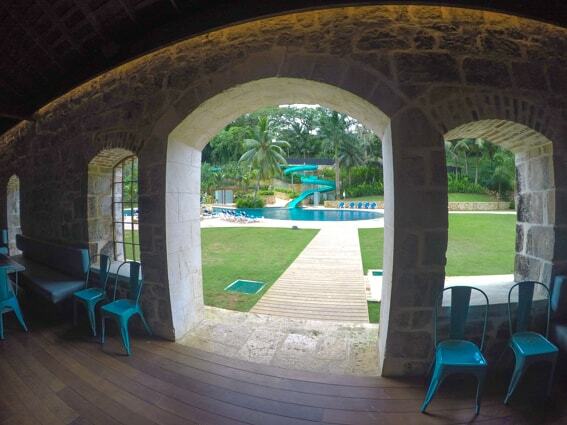 If you’re looking for a more relaxing experience, there is also the Mystic water slide and infinity-edged pool overlooking the city of Ocho Rios and the Caribbean Sea. This is one of those Jamaica vacation spots that have something for everyone! Personally, the hike up Dunn’s River Falls was the highlight of my visit to Jamaica. Feeling the rushing river over my feet as I scrambled over the rocks to keep up with the guide leading our group up the falls was exhilarating. It was quite a sense of accomplishment to complete the 45-60 minute climb over a series of waterfalls. Despite being a busy place, the views of the falls from water are like nothing that I’ve ever seen before. This is a truly unique experience! The climb begins at an ocean beach where the river meets the Caribbean Sea; little ones can happily be left behind with a family member or nanny to play in the sand while older siblings and parents complete climb. The maximum water depth along the climb is about 2-3 feet. So technically, a climber must be at least 36 inches to complete the climb. (I’d say that an adventurous five year old could likely do it.) There is also a splash pad to keep the tots entertained near the parking lot. 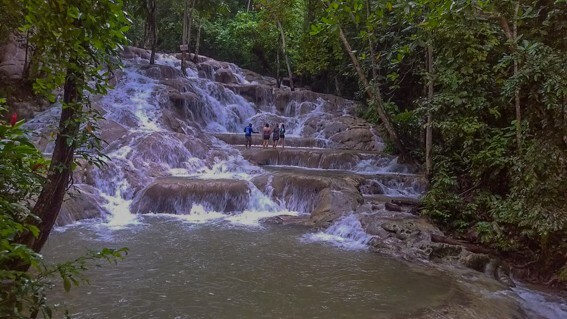 When to Travel to Dunn’s River Falls? Obviously a lot of cruise ships dock in Jamaica and send their hundreds of tourists out into Jamaica to visit the highlights, like Dunn’s River Falls. You’ll want to consult with your driver or resort concierge to find an opportunity to visit Dunn’s River Falls sometime when it’s not packed with American tourists. Or, alternatively speak with a trusted driver or resort concierge about alternatives like the Blue Hole instead. Chukka is one of the largest adventure companies in the Caribbean. Chances are good that if you have ever traveled to Jamaica, Belize, or the Turks and Caicos you have considered taking a tour with Chukka. Chukka Good Hope, the destination for my Chukka adventure, is conveniently located between Montego Bay and Ocho Rios. Generally, children over age 6 and taller than 48 inches can participate in most activities at Good Hope (except the ATV ride). 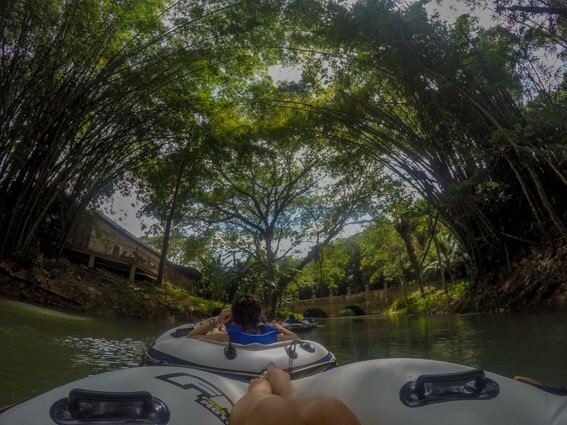 At Good Hope families can float leisurely down the Martha Brae River past scenic ruins of the old plantation while listening to their guide describe life in Jamaica today and 300 years ago. There’s enough white water to provide a bit of a thrill, but not nearly enough to knock a child out of the tube and into the river. After tubing, families return to the river, flying over it repeatedly on five thrilling zip lines. As zip line adventures go, this one is quite tame — perfect for beginners. Still, the adventure seeker in your family won’t want to miss out; the trip through the rainforest canopy is breathtakingly beautiful. For those seeking even more thrills there is an aerial adventure course on the property as well. Even the most energetic children will be worn out by the end of the day. After the day’s more thrilling adventures are over, families have the opportunity to relax by the pool. 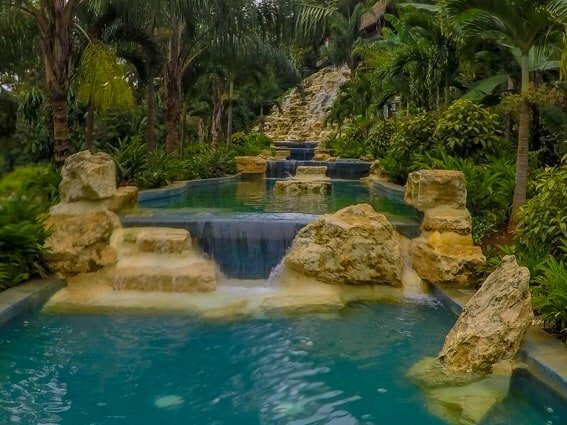 The pool at Chukka Good Hope is certainly one of a kind with a long water slide and a series of climbable waterfalls. Yes, they’re man-made. However, it’s still a thrill to climb from pool to pool. Ultimately at the largest waterfall, it is possible to climb up a few feet with the assistance of a guide and jump into the water below. Parents of tots will be happy to know that there are some zero entry points to the various pools so little ones can splash and play too. Of course, there’s rum punch for the adults and a full lunch buffet featuring Jamaican specialties like jerk chicken and festival as well. This is one of those Jamaica vacation spots that have something for everyone! I’m the type of person who likes to do it all myself — booking my own reservations on the internet and renting a car whenever possible. However, that’s not the best way to enjoy a Jamaica vacation, especially when you’re traveling with children. Why not? Because as beautiful as the ocean and mountains are in Jamaica, Jamaica isn’t Jamaica without its friendly people and amazing local food. 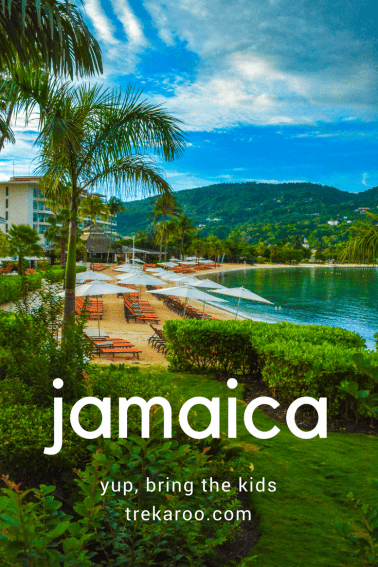 The best way to get to that local food and connect with the people of Jamaica is to hire a driver to transport your family around the island and serve as your connection with the locals. Yes, I traveled to Jamaica as a guest of the Jamaican Tourist Board, and my group was provided a driver for our trip. But, when I come back again with my family someday on a Jamaica vacation, I will most certainly contact Paradise Travels and ask for Willie. Willie quickly found out that enjoying local food was a high priority for our group and suddenly our drive from the airport became a food tour instead of a 100 km point to point transfer. By the end time together, Willie was taking our group into local grocery stores in Ocho Rios to find the spices that he cooks with at home and stopping at multiple fruit stands to find the passion fruit that I just couldn’t leave the Caribbean without eating. Willie bridged the gap so that we could freely interact with the locals to experience their warmth and friendliness. The food in Jamaica is just sooo good, but it’s difficult to know exactly how to find the best of the best on your own. 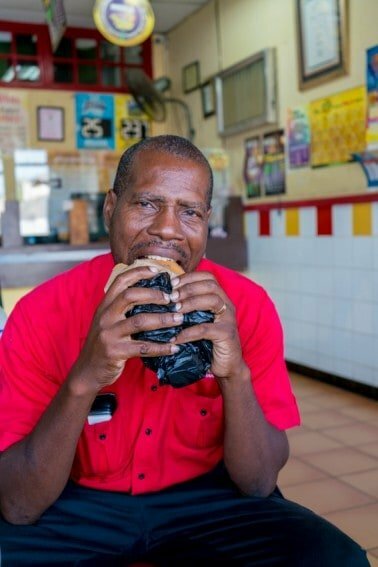 On our first afternoon, Willie took us to both Juici Patties, a fast food joint whose menu features the traditional Jamaican beef patty, and Scotchies, a tourist-friendly cafe serving some of the island’s best jerk chicken. 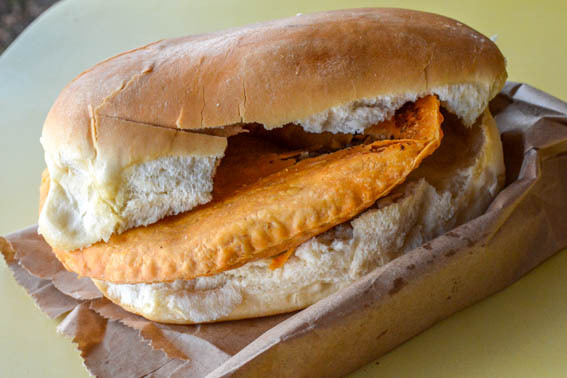 At Juici Patties, he ordered each person in our group a traditional beef patty, a large, hand-sized empanada, wrapped in a piece of coco bread, which looks and tastes like a coconut flavored burger bun (pictured above.) The meat is steaming hot and perfectly flavored – even my kids would have liked it. Later at Scotchies, we sat under a hibiscus covered pavilion and sampled both jerk pork and jerk chicken (pictured below;) Willie mixed up some special hot sauce for us by mixing ketchup and scotch bonnet pepper sauce. We also stopped at several roadside fruit stands during our visit. As you would expect, the bananas were amazing, creamy, tasty, and ripened to perfection on trees nearby. We learned about the starchy vegetables that make up much of the Jamaican diet. 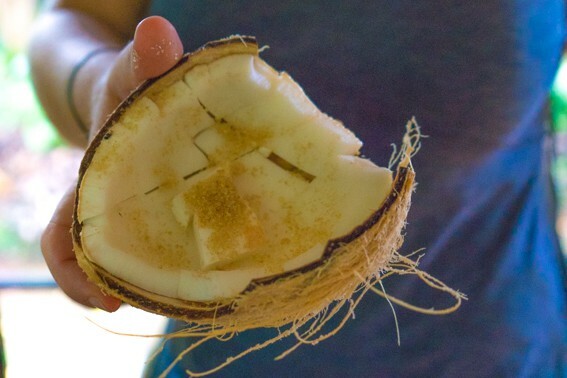 Of course, we savored a couple coconuts during our short island tour. 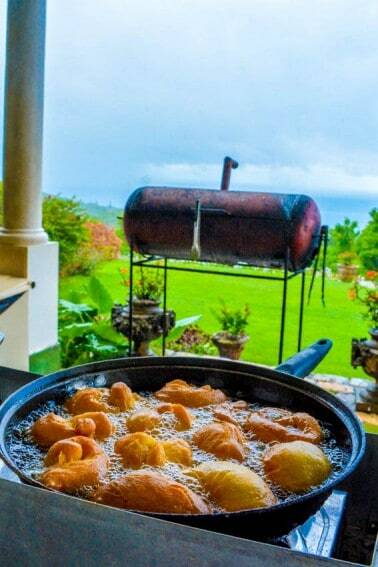 Tasting local food on a Jamaica vacation will surely inspire you to want to cook it back home. 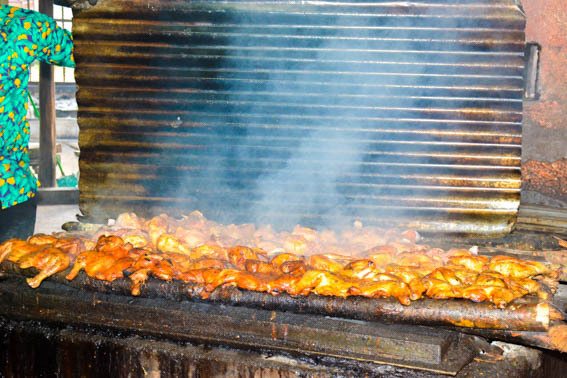 Yaaman Adventure Park, located just outside of Ocho Rios, offers a two-hour culinary experience that is perfect for families. Families assist a chef in making a full Jamaican meal including grilled jerk chicken, fried festival bread, steamed calalloo (greens) and a coconut sauce. It’s a memorable hands-on activity where kids can use their fingers to season their jerk chicken as much or as little as they’d like. They can also roll their festival bread into any shape before handing it over to the chef to drop in a pan of oil. The setting for this cooking experience and meal is on the back porch of a colonial mansion overlooking Caribbean Sea. The gardens out back are gorgeous. Tykes are welcome to run around on the lawn to burn off their extra energy. Leaving a place like beautiful Jamaica to head home is always difficult, but the transition out of vacation and back to real life is made much smoother, thanks to an airport club called Club Mobay. 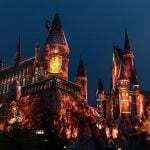 Purchasing admission to this club provides travelers with an expedited route through security, access to a large club with free food, open bar, comfy seating, and free WiFi, not to mention a soundproof, enclosed kids’ play area! Relaxing with a snack and drink before getting on the plane was a perfect end to a beautiful trip. There are many all-inclusive resorts in Jamaica for families to chose from on the island. 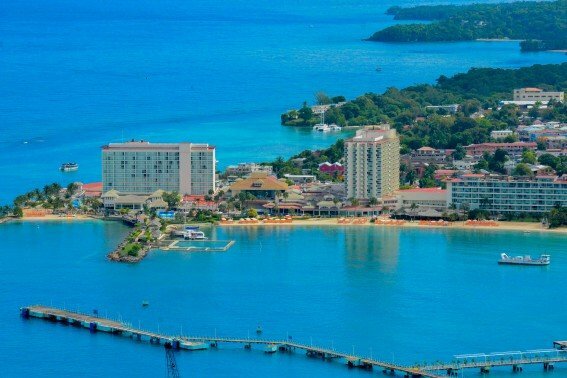 Trekaroo writers have stayed at or toured the following resorts in the area around Montego Bay and Ocho Rios. We can recommend these all-inclusive resorts in Jamaica based on our own personal experience. 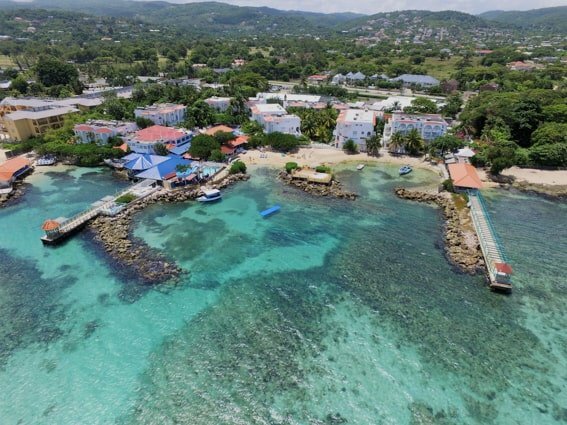 The Moon Palace Jamaica is centrally located in Ocho Rios within sight of where the cruise ship docks in the bay; it’s only minutes from attractions like Dunn’s River Falls, Yaaman Adventure Park, and Mystic Mountain. The most notable amenity at the resort is the 35,000 square foot AWE Spa, one of the largest in the Caribbean; fortunately, there’s also a kid’s club on property that provides childcare for parents who wish to take advantage of the spa services, which are only available to guests over age 18. 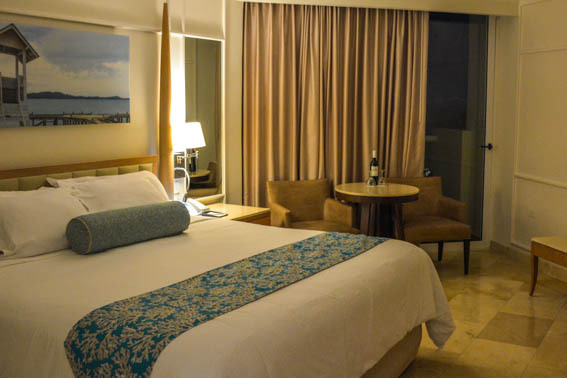 Moon Palace Jamaica offers rooms with either two double beds or one king bed. Families should request adjoining rooms. 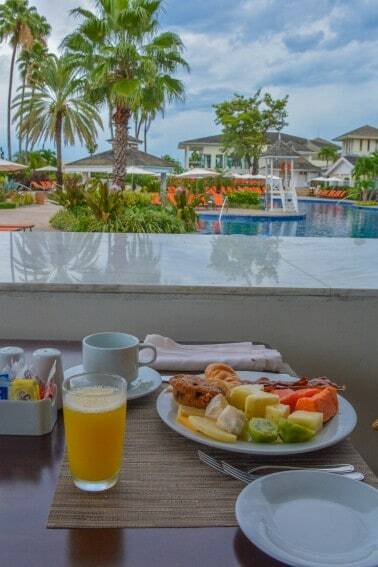 Many of the resort’s 700 rooms offer a small balcony overlooking the beach with amazing views of the sunrise. 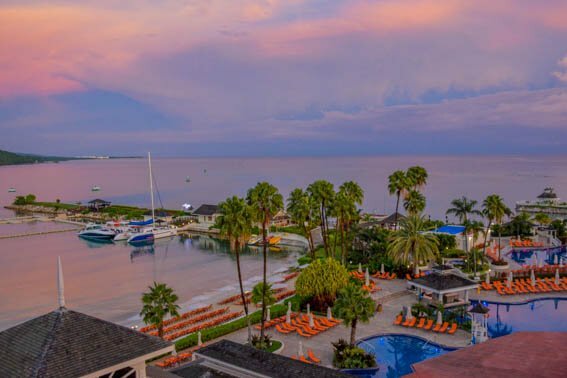 The all-inclusive resort experience for families at Moon Palace Jamaica includes a well stocked mini-bar featuring sodas, juice boxes, and domestic beer; 24 hour room service is also included. 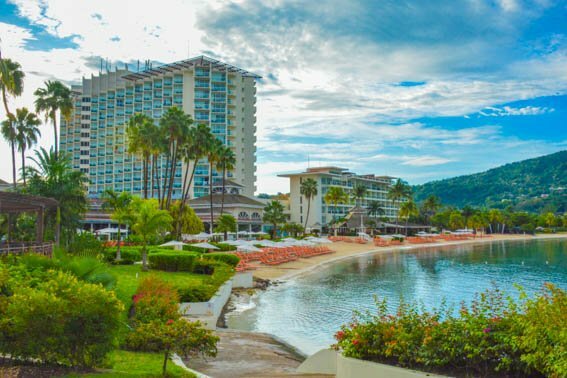 While my room wasn’t particularly large, I found that I did not spend much time there because there were so many other places, both indoors and outdoors, to relax around the this all-inclusive resort in Jamaica for families. In addition to the standard all-inclusive buffet fare offered at breakfast, lunch and dinner, the Moon Palace Jamaica has three a la carte restaurants open for dinner including Momo, featuring Asian inspired cuisine; Pier 8, serving seafood; and La Gondola, with a wide variety of Italian choices. During my short stay at Moon Palace Jamaica, I had the pleasure of eating at both Momo and La Gondola. Our sushi at Momo was fresh and presented spectacularly while our Italian dinner featured hearty Italian meals. There were a few really amazing dishes and some that were a bit bland; generally, the wait staff was able to make great recommendations. Adjacent to the lobby there are three small cafe areas where families can pick out a sweet treat or snack at almost any time of day. 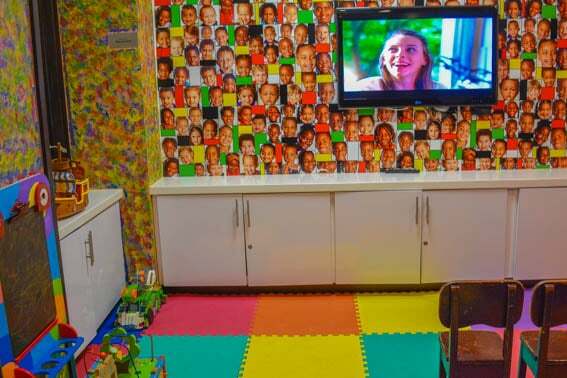 Children ages 4-12 will love the programming available at The Playroom at Moon Palaca Jamaica; children younger than 4 are also welcome to participate with adult supervision. 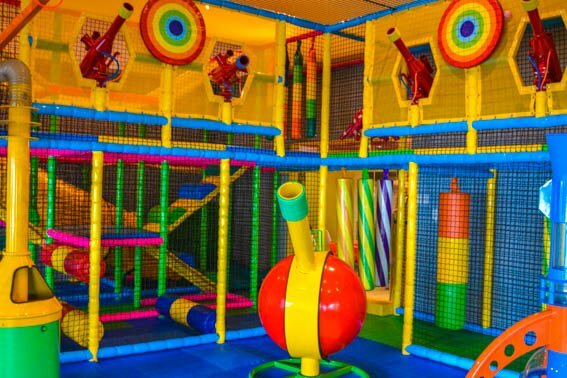 The Playroom is an indoor/outdoor facility featuring a splash pad, sandbox, climbing structure, and tot-sized bikes outdoors as well as a karaoke area, LEGO wall, dollhouses, and a large jungle gym indoors. Scheduled activities (including meals) run from 10AM-10PM. While my children were not traveling with me on this occasion, I spoke with several staff members at The Playroom, and was impressed by their knowledge of policies and procedures as well as their friendliness towards the children in their care. The Wired Teens Lounge adjacent to The Playroom is open daily for teens ages 12-17. 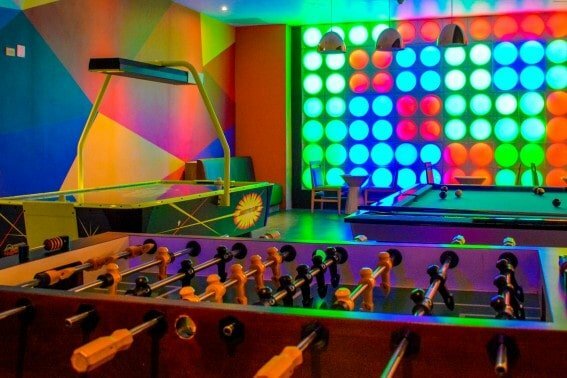 It features traditional games like foosball as well as arcade games free of charge. There are also snacks including sandwiches and ice cream available throughout the day. I took a long walk on the beach nearly every morning of my stay at Moon Palace Jamaica. The water of the bay gently laps at the shoreline making this the perfect place for little ones to play or for parents to sit out and enjoy the warm sun. Those looking for colorful fish or big waves won’t find those here, but the resort does offer a flow-rider that manufactures rideable waves in a small pool. There is also an extensive network of pools from which to chose at this all-inclusive resort for families in Jamaica. Stepping out of our van and into check-in at Franklyn D. Resort, it was immediately clear that that this resort is like no other on the island. There’s no expansive lobby smelling of fancy, floral aromatics; instead of being there to assist you, the resort staff greets you like they are welcoming you to their home. And they are; this resort is Jamaican through and through. It is certainly one of the best all-inclusive resorts in Jamaica for families. Every family who checks in at FDR receives a Vacation Nanny as part of the package. This vacation nanny is available for the family from 9AM-4:40PM daily; she cares for the children as needed, cleans the suite, and makes sure all necessary arrangements are made for excursions. The 78 suites at FDR are more functional than luxurious. The aim is to make families comfortable and relaxed, providing all the necessities. Decor is simple and colorful, definitely not fancy or fragile. There are suites to suit every families, including multi-generational ones; the smallest suite is one bedroom with a king bed in one room and two twins in a separate living area. The smallest suite that we saw at FDR was much larger than my room at our luxury resort. While I did not have the privilege of staying the night at FDR, I did enjoy their Jamaican night buffet. It was amazing! Again, nothing fancy, but so very flavorful and authentic. 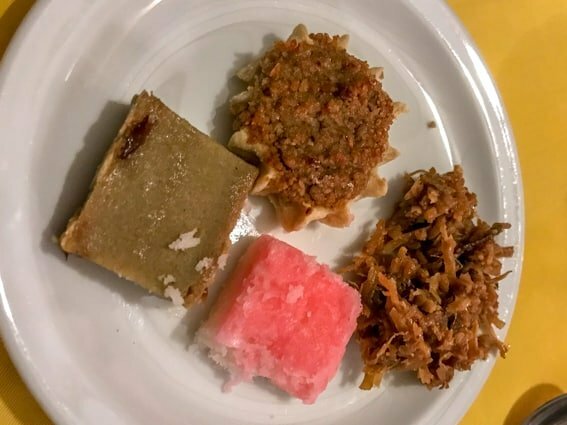 Most desserts featured fresh coconut including a pink sugary one that simply melted in my mouth, and our entire group raved about the ox-tail stew. There were also fresh juices; beet and cucumber were featured the night of our visit. Of course, the was a full drink menu for adults. We all agreed that FDR’s creamy pina colada was the best cocktail of our entire Jamaican trip. Some families were dining with their nannies, who stayed on past 4:40 for an additional hourly fee. Other families were simply enjoying their dinner with their kids. With lots of tots around, we saw plenty of spills and such, but staff came around to help out and take care of the mess quickly. We most enjoyed the music and watching the kids dance nearby; everyone was so relaxed! There are also adults-only restaurants on property. 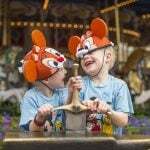 Each restaurant area has its own schedule and opens on specific days depending upon the season. In addition, there was also a children’s movie being shown adjacent to the main open-air dining area. Children who have finished eating before their parents could watch the movie as their parents finished their meal. Every detail is taken care of at FDR. 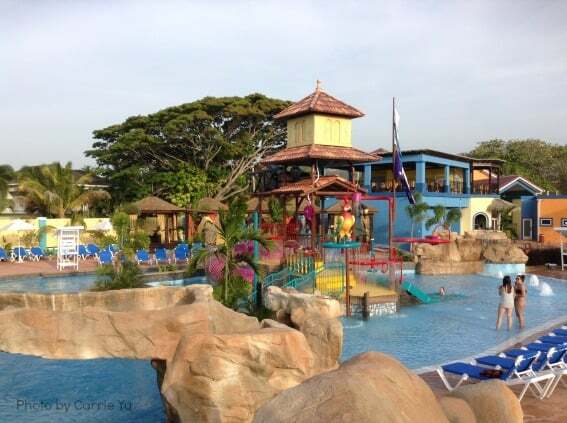 It is certainly one of the best all-inclusive resorts in Jamaica for families. FDR has a pool with a tot-sized water slide and a separate pool with a larger water slide for older children. There’s also two separate beaches – one with calm water and plastics toys for preschoolers and another with more open water for swimming. Play areas abound throughout the resort from miniature golf to toddler climbing structures – there’s no shortage of places to play. 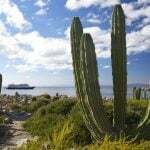 In addition to pools, beaches, and play areas, there is also a full schedule of activities from crafts to yoga to snorkeling. FDR has access to a glass bottom boat that they take out on the Caribbean Sea at scheduled times; they also offer fishing excursions. Kayaks are available to guests daily. Want to see the real Jamaica on your Caribbean vacation? FDR offers complimentary shopping trips, market visits, and school visits on a regular basis. *Thanks to the Jamaican Tourism Board for hosting me on this trip and providing me with activities and accommodations. All opinions are my own. Also, Thanks to Carrie Yu who wrote the first version of this article in 2015. Sounds like you and your family had a wonderful time. I’ve never been to Jamaca but I just got back from the Bahamas this past week so I know what you mean about the lush beautiful crystal clear water. Since I live in Houston, the closets ocean we have is Galveston and there is nothing pretty about that water which is why we do love to escape to tropical paradises. Thanks for sharing this with us and glad you had a wonderful time.